Goodbye, January. Hello sweet new deals! 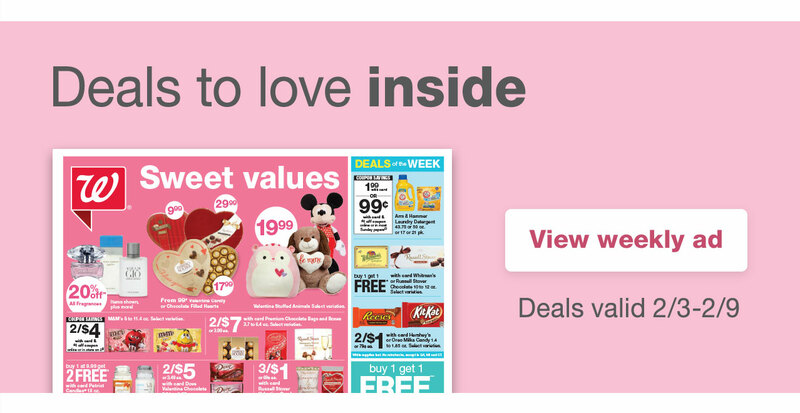 See new Deals of the Week on candy and up to 40% off fragrances in time for Valentine's Day, new coupons and more. Bonus points offer, 2/2-2/8: Limit 1 storewide coupon redeemed per transaction. Clip to card to use in store or online (must be logged in). Valid thru 2/8/19. Points good on future purchases. Purchase requirement must be met in a single transaction, before taxes and shipping, and after discounts, store credit and redemption dollars have been applied. Void if copied or transferred. Excludes photo orders not picked up in store, alcohol, dairy, tobacco, gift cards, clinic services, prescriptions, pharmacy items or services, sales tax and shipping. Other exclusions apply. Complete details at Walgreens.com/Balance. General: Available at Walgreens stores and www.Walgreens.com while supplies last. Weekly Ad and coupon prices good 2/3/19-2/9/19 except when otherwise noted. Balance Rewards card required for sale pricing. Not all products and prices available in all stores in the following markets: U.S. Virgin Islands, Puerto Rico, Hawaii, Alaska, San Francisco and New York Boroughs: Manhattan, Brooklyn, Bronx, Queens and Staten Island. Void where prohibited by law. Unless stated otherwise, all coupons have no cash value. Terms of promotion subject to change. For Balance Rewards program details, visit Walgreens.com/Balance. General offers: (Deals of the Week; fragrance): Restrictions apply. Buy 1 get 1 offers valid on select items of equal or lesser price (must add 2 eligible items to cart to receive discount). Offers available at Walgreens.com with the purchase of eligible products. Void where prohibited by law. Orders must be placed by 11:59 p.m. Central Time on 2/9/19 to qualify. Timing is determined by Walgreens server clock. Offers do not apply to bulk orders, back-ordered items, and out of stock items. Not redeemable for cash or transferable, and void where prohibited. Walgreens reserves the right to make changes to or discontinue any offer at any time. Seniors Day:Balance® Rewards card required for discounts. Discounts available for 55+ or AARP members. See AARP for terms of service and Walgreens.com/Balance for complete details. AARP receives a royalty for the use of its intellectual property. Amounts paid are used for the general purposes of AARP and its members. Complete details at Walgreens.com/Seniorsday.